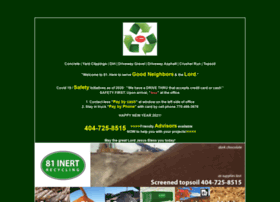 81inertrecycling.com 404-725-8515 is a leading green waste recycler recycling concrete, asphalt, topsoil, dirt, brush, compost, mulch. 81 helps customers save money by delivering dump truck loads of screened gravel, crushed concrete, screened topsoil, crushed asphalt, screened fill dirt and mulch. 81 works with good customers and helps everyone in Loganville, Walton County, Gwinnett County, Barrow County Recycle the Earth.